Our tours depart from the Southeast corner of the Michigan Avenue Bridge. Look for our blue awning at the top of the stairway. GPS users enter 112 E. Wacker Drive. Chicago's Riverwalk winds along the South Side of the Chicago River welcoming pedestrians to enjoy Chicago from a unique perspective while strolling along the River's edge under the State Street, Wabash Avenue and Michigan Avenue bridges. If you'd like to avoid the stairway, there are convenient ramps located nearby at State St. & Wabash Ave. View accessibility info here. Mercury Ticket Box Office on Chicago’s Riverwalk. Look for the blue awning at the southeast corner of Michigan Avenue and Wacker Drive. Please use 112 E. Wacker Dr. for GPS Navigation. The parking garage entrance is the first driveway on Wacker Drive east of Michigan Avenue. This garage is directly across the street from the stairway to our dock and next door to the Chicago Architecture Center. Receive a discount for up to 4 hours of parking at the LAZ garage at 111 E. Wacker Dr. If you park longer than 4 hours, discount is no longer valid (see rates). You must have your parking ticket stamped at our ticket window or bar onboard the boat to receive the discounted rate. Tickets stamped at the bar must be further validated at parking garage onsite office prior to departing garage. Avoid the need for validation by making a self parking reservation online. Exit at Lake Street Station and proceed east 2 blocks to the east side of Michigan Avenue. Continue north to Wacker Drive. Look for our blue awning marking the stairway entrance at the southeast corner of the Michigan Avenue Bridge and Wacker Drive. Exit at Washington Street Station and proceed east 3 blocks to the east side of Michigan Avenue. Continue north to Wacker Drive. Look for our blue awning marking the stairway entrance at the southeast corner of the Michigan Avenue Bridge and Wacker Drive. Exit at State/Lake St. Station and proceed east 2 blocks to the east side of Michigan Avenue. Continue north to Wacker Drive. Look for our blue awning marking the stairway entrance at the southeast corner of the Michigan Avenue Bridge and Wacker Drive. Take the 151 bus, which runs north and south along Michigan Avenue. Exit at Wacker Drive and walk across intersections to the Southeast corner of the Michigan Avenue Bridge. Look for our blue awning marking the stairway entrance. As you begin to enter downtown Chicago exit on right at OHIO STREET. Continue Eastbound on Ohio Street and turn Right (South) on WABASH AVENUE. Cross over the Chicago River and turn left (East) at first street, WACKER DR. Continue Eastbound on Wacker Drive. Cross through the Michigan Avenue intersection and look for the first driveway East of Michigan Ave., on your right which is 111 E. Wacker Dr. / Systems Parking Garage. It is a self park facility and is available to our customers on a space available basis. Walk across the Street (North) and look for the Blue Awning marking the stairway down to our Riverside Gardens Dock and Mercury Skyline Cruiseline. Continue east through the old Post Office and continue to Michigan Avenue. You must go straight at that light, but get ready to turn left at the next light which will take you Northbound onto Michigan Avenue. Travel past Millennium Park and continue North to Wacker Dr. Turn Right onto Wacker Dr. and take the first right hand driveway into the 111 E. Wacker Drive Parking facility..
Exit at Wacker Drive (Upper) and continue Westbound. Parking is on your left at 111 E. Wacker Dr. Look for our Blue Awning when walking to the dock, which is located at the SouthEast corner of the Michigan Avenue Bridge. Ramp at Wacker Drive & Wabash Avenue: Once at Riverwalk level, proceed east and you will find our ticket office marked with blue awnings just beyond the Michigan Avenue Bridge underpass. Ramp at Wacker Drive & State Street: This ramp is ADA-compliant. 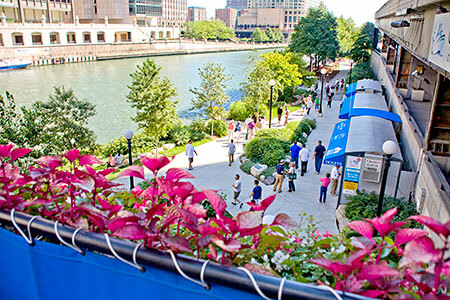 Once at Riverwalk level, proceed east 2 blocks until you see our blue ticket office awnings just past the Michigan Avenue Bridge underpass. Metered Parking: Located on Lower Lower Wacker Drive (steps from the drop-off area) and payable with a credit card. Discounted Parking at LAZ Garage (111 E. Wacker Drive): Garage entrance accessible via Upper Wacker Drive. Please note, guests arriving by taxi will want to prearrange pick-up because no taxis are waiting on the lower lower level.